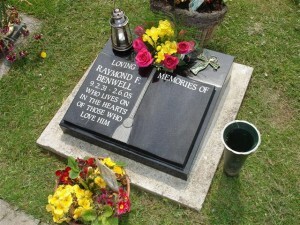 We provide a full service to our customers from renovation works on existing memorials such as cleaning, repairing, repainting and regilding inscriptions to supplying new memorials from small cremation tablets through to lawn memorials and large kerb sets. We can supply any stone required in any range of colours and finishes. Brochures are available on request and we have a large selection of memorials on display at both our premises. For those people that are unable to come to see us we can arrange to visit you at home by appointment and bring information and samples with us. Burial grounds are controlled by different organisations. They may be churchyards controlled by the local diocese, burial grounds run by Methodist or other denominations or cemeteries controlled by city, town or parish councils. In all these cases we have much experience in dealing with these organisations and we can advise on their regulations and make the necessary applications for memorials on your behalf so that you don’t have to worry about all the paperwork. Click on one of the links below for more information.